Previous edition: Harlow: Pearson Longman, 2012. From the BESTSELLING Law Express revision series. 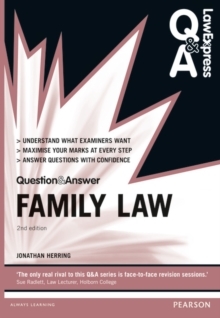 Law Express Question and Answer: Family Law is designed to ensure you get the most marks for every answer you write by improving your understanding of what examiners are looking for, helping you to focus in on the question being asked and showing you how to make even a strong answer stand out.